Princess and Ondal, A Magical Musical! Once upon a time in an ancient land called Koguryo, there was a princess who cried too often! Not a single soul could console the beautiful princess. Her father, the King, could only make her stop crying when he would tell her that she would have to marry Ondal, the most foolish person in the kingdom. Little did she know that this harmless threat would be the path she would choose to live out her life. Join us on this magical singing and dancing journey with our princess as she leaves her royal lifestyle to instead look for the most foolish person in the kingdom so that she is freed from marrying an aristocrat that she did not love. Watch as our very clever princess transforms the fool into the great leader and warrior that he was destined to be. Our musical stars 12 children from Seoul, South Korea as well as 8 children from Fresno and Clovis. We are directed locally by Miss Fresno 2011 Valerie Salcedo and are honored to be fundraising for Central Valley Honor Flight, a charity that benefits military Veterans. This is an amazing and educational musical for the entire family! 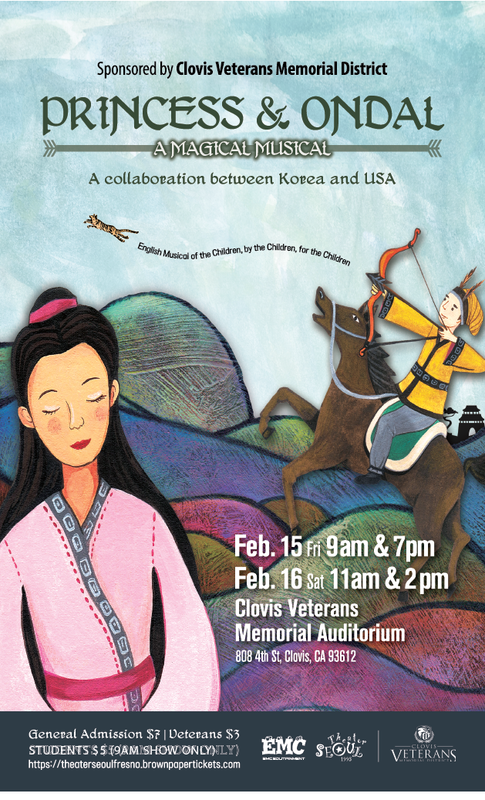 Our performances are generously sponsored by the Clovis Veterans District and produced by Theater Seoul and Marketing IQ Club of Fresno. ***Any school that would like to attend our Friday 9am show on 2/15, please email jennifer@marketingiq.club. Student tickets for this show are $5 each.